I'm sharing some of my previous Winter tablescapes. If you'd like to read the full post for any of these tables, please click on the post title under the image. It snowed on the table again in 2014. I was really into snowy tables in 2014. This was a fun game night table I put together in 2013. 2013 brought more snow to our tables. And it even brought snow and ice to one table. It's always fun to celebrate Mardi Gras. In 2011, my grandchildren and I had fun learning about the Chinese New Year celebration. 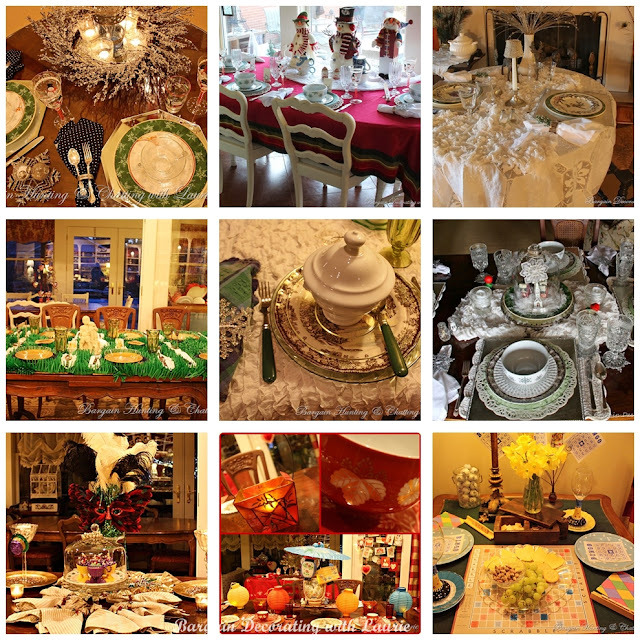 When I started this post, I was surprised at how many Winter tablescapes I've posted. I didn't want to bore you with so many of them all at once, so I'll be posting more Winter tablescapes next week. I hope you'll come back to check out those scapes too. Hi Laurie, all your tables settings are spectacular. I love them all. Especially the game night table and the snowy table. Thanks for sharing all your ideas and inspirations. They are all gorgeous. I can't pick a favorite. Beautiful tables. If i had to pick, it would be the snowmen table. I love looking at all of them. Great inspiration, I was beginning to feel stuck with my tables.